Welcome to the exciting musical world of Tim Whitmer. Tim has rightly been called a "maestro for all seasons." And now, you can e-mail Tim directly with your questions and comments at . Just click here! Whether it is at one of Kansas City's hot nightspots with the award winning Tim Whitmer and the KC Express, at your convention with Tim Whitmer as Master of Ceremonies, at a corporate event or wedding party with a distinctive Tim Whitmer flair, Tim Whitmer Productions unparalleled professionalism will make your event more entertaining than you can imagine. In addition, Tim is one of the area's most sought after church musicians. In particular, his Tender Transitions program has redefined and reinvigorated memorial services across the country. For complete info on his wide variety of church services, please hit either Tender Transitions or Tim's Church Work. Established in 1988, Tim Whitmer Productions (TWP) specializes in fulfilling your entertainment needs with just the right mix: the right size group, with the right musicians and instrumentation, at the right time. From the time you book a TWP performance until the event comes to a close, we will be paying special attention to the level of detail that assures success. Tim Whitmer recordings are available at all of our events. Many of your guests will want to take home autographed copies to remember their wonderful experiences. A common myth about Kansas City jazz is that the tradition ended in 1940 with the fall of the Pendergast political machine. 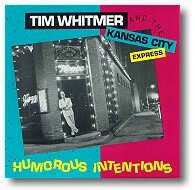 That obituary was a bit premature, as pianist Tim Whitmer and friends aptly illustrate with "Humorous Intentions" - Kansas City jazz lives! Charming audiences nightly in Kansas City's best jazz venues,Whitmer carries on/expands the tradition of Kansas City jazz with his inventive treatment of standards and fanciful original compositions. Classically trained, Whitmer followed the siren's call of jazz, after studying at the Conservatory of Music at the University of Missouri Kansas City (UMKC) with George Salisbury, a brilliant harmonically advanced pianist, who studied with Mary Lou Williams. Since then, Whitmer has led a series of renowned bands, drawn from local jazz legends and talented young players. 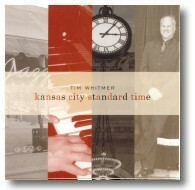 Whitmer brings together these elements, an abiding respect for the tradition, enhanced by his own distinctive compositions magnificently rendered by a group of talented and experienced musicians for Kansas City Standard Time.